A relaxing weekend in Puglia but all too short. Flew out late Thursday night - Alitalia via Milan - and arrived 01:30am Friday morning. It was a weekend free of maintenance activities but we still had plenty of stuff to do. Met with Pierdonato to top up the kitty for cleaning and management fees. Next on to the local hardware store to replace a couple of beach chairs that had been nicked by some opportunistic passer by. After lunch it was a trip down to Conforama (superstore at Fasano) to look for more sun loungers, replacement BBQ and cushions. 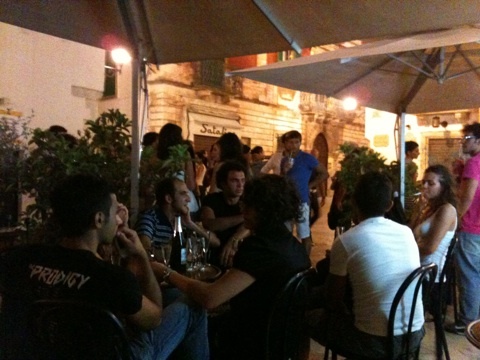 The evening was a meal in our regular haunt, restaurant Centro Storico, calling in for a pre-prandial drink at Chris and John's on the way out. After the meal we strolled around the old town and sat in the Caffe Della Villa for some ice cream, live music and people watching. Saturday was down at the beach interspersed with lunch at Rotonda de la Rosa 2. 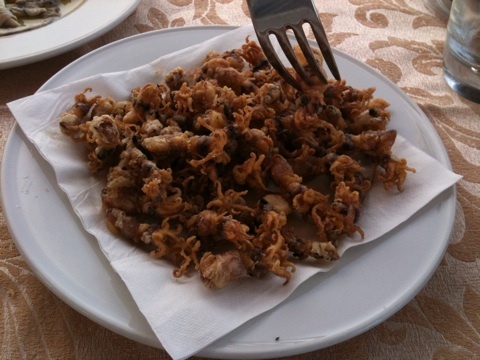 The original Rotonda de la Rosa is a basic beach shack serving good food and Rosa recently expanded into a real restaurant on the outskirts of Torre Canne. Similar menu but linen tablecloth and glasses instead of paper and plastic. 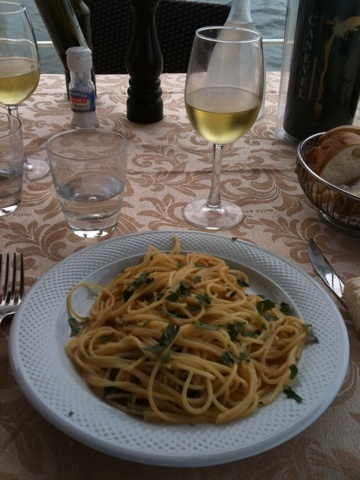 Starters inc. deep fried moscardine (micro-squid), spaghetti con ricci (sea urchin) and a nice glass of Falanghina. Followed by siesta on the sand. 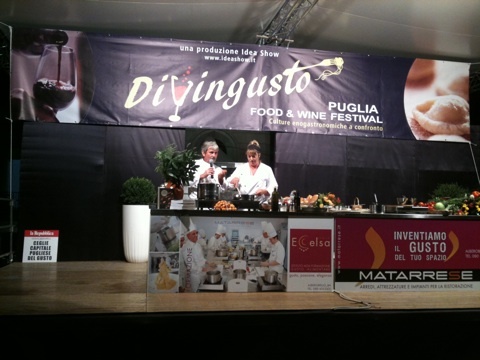 This weekend happened to be Divingusto - the Puglia Food and Wine Festival - held in Ceglia Messapica. You buy a book of tickets then wander around and exchange at the stalls for local produce. In the main Piazza del Populi a stage was set up for cooking demonstrations. Our friend Domenico 'Mino' Maggi was compere and also stood in for the chef of the Madrid Ritz who was not able to make it. Special festival guest was Carluccio who was wandering round mingling with the crowd so we all shook his hand. It was late by the time we got home. Sunday was basically get up, have breakfast and go. Still it is only four weeks till we go back out again. This time for the August bank holiday and a full week's holiday. Yay! A crowd of people I met way back in 1980 get together on an irregular basis. One of the triggers for such gatherings is a visit to the UK by Maureen who left for Australia in the early 80's and never came back except as a visitor. As previously Bill hosted the event; as he lives in Chiswick we decided to cycle the five miles to get there. 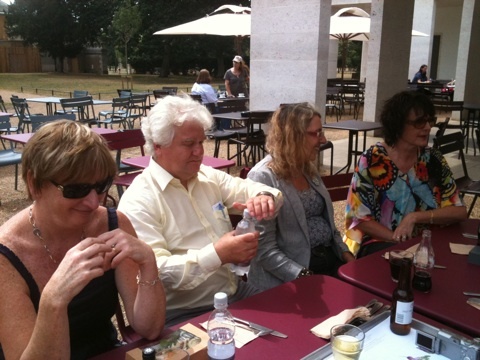 On this occasion we met for lunchtime drinks followed by a stroll to Chiswick House Cafe for a light lunch. As always it is like watching time lapse photography of our lives shown at high speed. People get married, have children, re-marry; hair grows greyer or scarcer; waistlines expand. It was great see everyone again and we would have stayed longer but we had another back-to-back social engagement. We cycled off to Kingston to celebrate both Chris and Sue's birthday, the former very belatedly the latter in advance. It was a hectic and steamy pedal along the Thames path and we had to keep the pace up to make it in time. 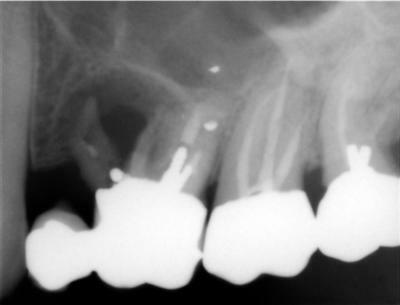 Adding to my collection of dental x-rays and not in a good way. A couple of weeks back one tooth felt a bit loose but thinking it was possibly a bit of gum inflammation I was assiduous in my dental hygiene and it seemed to improve. But then it got worse and a trip to Harley Street was quickly arranged. Raj was away but his oppo, Lawrence, did the honours with an x-ray and the bad news. One of the roots under the crown had broken off and gone septic - now lying at a jaunty angle (to the left of the x-ray). So it is a week on the Amoxicillin followed by a surgical extraction. Not something to look forward to - doubleplusungood. Sometimes DIY projects go, more or less according to plan. 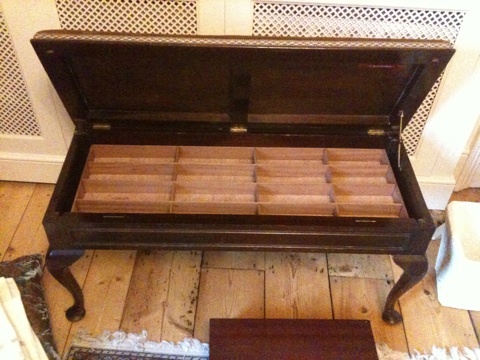 Mary wanted to de-clutter the living room by relocating the cutlery from the overcrowded canteen into the piano stool. Unable to find ready made cutlery holders of the correct dimensions in Homebase or B and Q she suggested that I could make a custom tray. With the enthusiasm dial turned low I agreed. Much to my surprise - starting with five slats, an electric jigsaw and copious quantities of wood glue - that is what I succeeded in building with minimal hiccups or cussing. 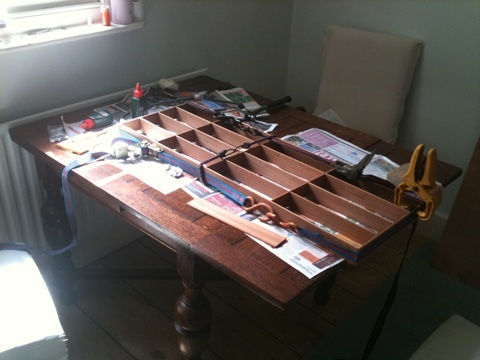 All manners of belts and braces were co-opted to hold the thing together while the glue set. 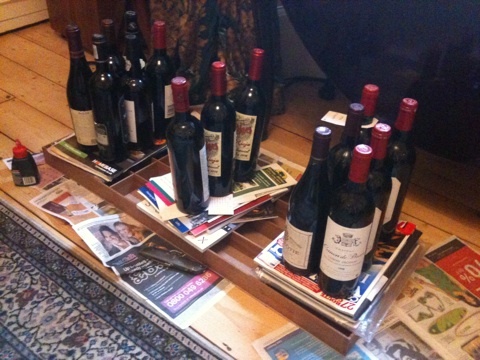 The dividers were weighted down with magazines and whatever nearby heavy objects came to hand - in my case a variety of fine wines. A snug fit with the intended 5mm clearance all round. 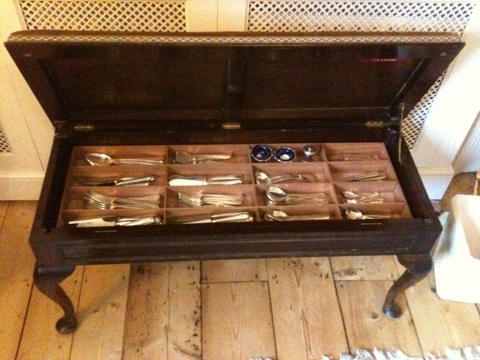 And finally full of cutlery as intended. Look upon my works ye mighty and despair. Saturday night we had nothing planned so when Mary asked what I fancied doing I said "live music". 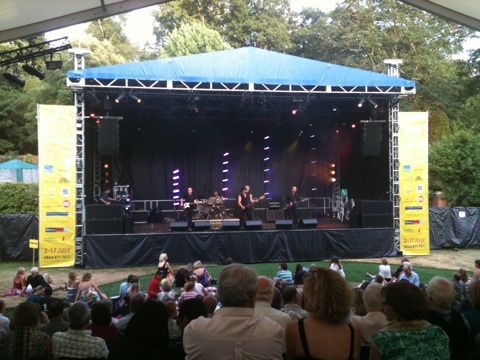 A quick google revealed the Cannizaro Park Festival featuring The 60's Allstars. Perfect for a warm summer's evening so we booked ourselves a pair of tickets. Cannizaro Park is on the edge of Wimbledon Common and part of my old stomping ground. 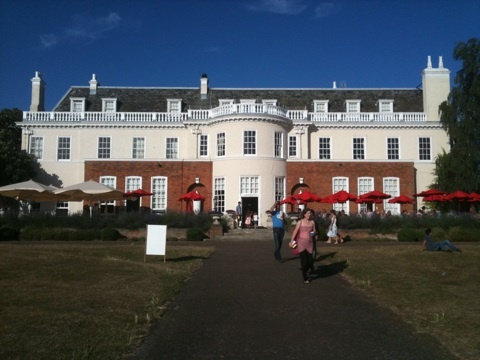 We got there early for a wander round and a light supper before the concert at Cannizaro House Hotel - which is where we spent our wedding night. The festival was well set up with food stalls, bars, a picnic area and all in the beautiful surroundings of the park. 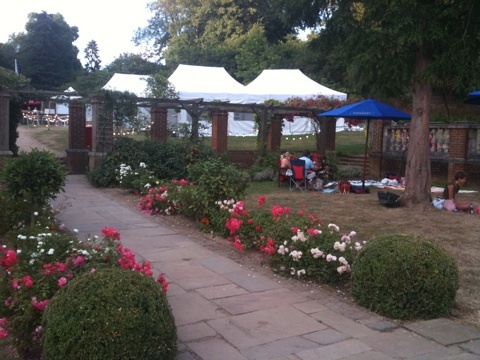 The festival itslf was situate in a walled garden. 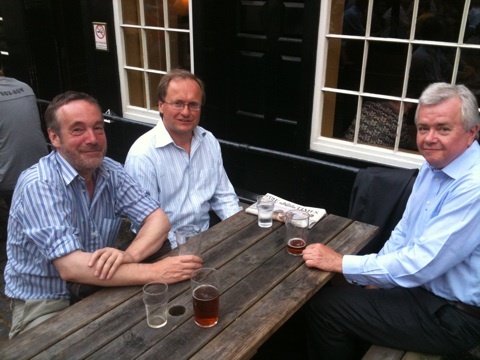 A beautiful summer's evening made The George near London Bridge a fine choice of venue. 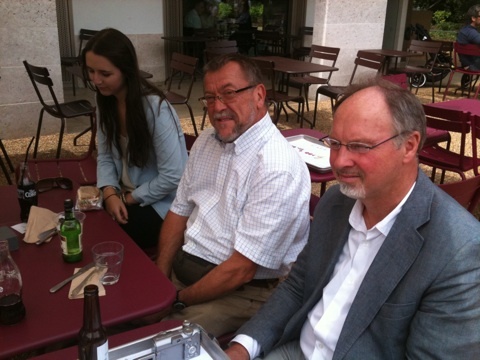 A small but select group made it for a number of beers including a welcome newcomer - Valter Johansson, formerly of CSC Index. Mike (tafka Ben) is my sister Jane's son, the eldest of my nephews and the first to get married. Mike and Vanessa's wedding was held at Middle Coombe Farm, Devon. We went down by train to Tiverton on the Friday night for an informal gathering and barbeque. We stayed at the nearby Globe Inn in Sampford Peverell along with other guests including long time friend Jane (Fuller) and husband Brock. The wedding turned out to be - mostly - more formal than I had expected from an eco venue. The groomsmen were all in matching outfits with fancy waistcoats and cravats. The bridesmaids had coordinated range of anemone coloured outfits and the wedding breakfast included the standard set of speeches. 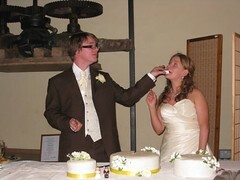 Mind you it was the first time I have seen a Best Man's speech involving a ventriloquist's dummy. What was different was between the ceremony at noon and the wedding breakfast at five o'clock. We all took a walk in the woods to an old oak tree where Mike and Vanessa addressed the assembled guests and there were readings from the two mothers, Vanessa's sister, Joanna, and Mike's youngest brother, Tom. Then it was back for tea and scones and an opportunity to mingle until the hog roast was ready. We then ate, drank, applauded the speeches and various friends made up two bands for music and dancing. It was an excellent day and Mike is clearly so much in love with Vanessa it was heartwarming to see - not a dry eye in the house - has anyone got a hankie please.